Saraswati - Goddess of knowledge, music, arts and science. - Hindu Goddess. 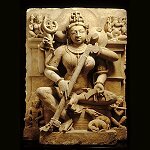 Saraswati she who has flow Goddess of knowledge music arts and science. Home ¦ Divinity of the Day ¦ Hindu Gods and Goddesses ¦ Saraswati - Goddess of knowledge, music, arts and science. Saraswati - Goddess of knowledge, music, arts and science. Saraswati ("she who has flow"), Goddess of knowledge, music, arts and science. She is the consort of Bramha and his Shakti, and it was with her knowledge that Brahma created the universe. She is part of a trinity with Lakshmi and Parvati, who help Brahma, Vishnu and Shiva in the creation, maintenance and destruction of the Universe. She is generally shown to have four arms, which represent the four aspects of human personality in learning: mind, intellect, alertness, and ego.